One of the state's newest seaside parks, Avalon has more than a mile of increasingly rare undeveloped beachfront. The park provides habitat for many species of wildlife. Threatened and endangered sea turtles, like the loggerhead, Atlantic green, and leatherback, nest on the beach during the spring and summer. For beach recreation, boardwalks over the fragile dunes welcome swimmers, snorkelers, and sunbathers. Cape Florida is the home of a historic lighthouse built in 1825 and reconstructed in 1846, the oldest standing structure in Miami-Dade County. Visitors come to the park to sunbathe, swim, and picnic on over a mile of sandy Atlantic beachfront. Biking and kayaking are also popular activities. Anglers can throw in their lines from the seawall along Biscayne Bay for some of the best shoreline fishing in the region. Guided tours of the lighthouse and lighthouse keeper´s cottage are given twice daily, Thursdays through Mondays. The Boater´s Grill offers casual waterfront dining, or picnickers can reserve a pavilion and grill their own dinner. Bicycles, beach chairs, and umbrellas are available for rental. Overnight boat camping is allowed in No Name Harbor, and a primitive campsite is available for organized youth groups. Located at the southern end of Key Biscayne off the Rickenbacker Causeway, south of downtown Miami. The shores and coastal waters at this park provide an abundance of recreational opportunities. The breathtakingly beautiful half-mile beach welcomes visitors for swimming, snorkeling, surfing, and scuba diving. Beachcombing, picnicking, or just relaxing on the sand are also popular activities. Dynamite Point was once the training site for WWII Navy Frogmen, but is now a haven for birdwatchers. Along the south end of the park, Fort Pierce Inlet is a popular place for anglers to catch their dinners. Jack Island Preserve, located one mile north of the park, has trails for hiking, bicycling, and nature study. At the west end of the Marsh Rabbit Run Trail, visitors can climb an observation tower to get a bird's-eye view of Indian River and the island. A primitive youth/group campground is available on a reservation basis; please call the park. Located four miles east of Fort Pierce, via North Causeway. A short walk from beachside shops and condominiums, this park is an oasis of tropical hammocks-a gift from Hugh Taylor Birch to Florida's posterity. His former estate preserves four distinct natural communities, nestled between the Atlantic Ocean and the Intracoastal Waterway. Visitors can rent a canoe and paddle along a mile-long freshwater lagoon or fish from the seawall. Nature lovers can hike along two short trails and learn about local plants and wildlife while bicyclists and skaters glide along the paved park road. Visitors can access the beach via the pedestrian tunnel under A1A. Picnic areas overlook the channel; pavilions with water and electricity are available for rental. A group/youth campground is available to organized groups. The Terramar visitor center features the area's natural and cultural history. Located on East Sunrise Boulevard in Fort Lauderdale, off A1A. In the 1970s, businessman John D. MacArthur donated the land for this park to preserve a subtropical coastal habitat, much of which had already been lost to urban sprawl. A unique mixture of coastal and tropical hammock and mangrove forest, this barrier island provides a haven for several rare or endangered native tropical and coastal plant species. The park's nature center shows visitors why the park is a biological treasure. Visitors can swim, picnic, and surf at the beach; scuba diving and snorkeling are also popular activities. Birdwatchers can see herons, brown pelicans, terns, sandpipers, and gulls. Anglers can fish in the lagoon by wading, kayaking, or canoeing-they can also fish from non-swimming areas of the beach. Located in northern Palm Beach County, 2.8 miles south of the intersection of U.S. 1 and PGA Boulevard on A1A. Located just south of Stuart, this park teems with wildlife in 13 natural communities, including sand pine scrub, pine flatwoods, mangroves, and river swamps. The Loxahatchee River, Florida's first federally designated Wild and Scenic River, runs through the park. Ranger-guided tours of the 1930s pioneer homestead of Trapper Nelson are available year-round. Visitors can enjoy paved and off-road biking, equestrian, and hiking trails. Boating, canoeing, and kayaking along the river are also great ways to see the park. Anglers can catch freshwater fish along the riverbank or from a boat. The park offers two full-facility campgrounds and a youth/group primitive campground. Visitors can arrange boat tours of the river and rent canoes, kayaks, and motorboats by calling (561) 746-1466. Located 12 miles south of Stuart on U.S. 1. Perfect for a day at the beach or a family picnic, this park provides an abundance of recreational activities. Fishing from the rock jetties, surf casting, canoeing, swimming, nature study, boating, and picnicking will keep the whole family busy. For those interested in South Florida's underwater beauty, Lloyd Beach has one of the easiest and most interesting shore dives in the area. The park has two boat ramps with easy access to the ocean through the Port Everglades Inlet, which will please those who prefer to fish in open water. The mangrove-lined waterway is a scenic place to canoe, observe bird life, and take photographs. At the Loggerhead Café, visitors can have a leisurely lunch or grab a quick snack. A variety of items are available for rental: canoes, kayaks, paddleboats, sailboats, pontoon boats, gazebos, barbecue grills, and volleyballs. Located north of Hollywood, off A1A. Did you know that the park is a frequent location for filming of movies and commercials? Bad Boys II, CSI Miami and Showtime have all filmed here! Freshwater marshes or "savannas" once extended all along Florida's southeast coast. Stretching more than 10 miles from Ft. Pierce to Jensen Beach, this preserve is the largest and most intact remnant of Florida's east coast savannas. A good place for visitors to start is the Environmental Education Center where they can learn about the importance of this unique and endangered natural system. Picnic tables are available near the center. Canoeing, kayaking, and fishing in the wetlands are popular activities. Wildlife enthusiasts and photographers can enjoy the diversity of habitats this undisturbed area offers. Over eight miles of multi-use trails provide opportunities for hiking, bicycling, and horseback riding. Guided walks and canoe trips are available by reservation. The Education Center is located in Port St. Lucie, two miles east of U.S. 1 on Walton Road. This classic Florida barrier island is accessible only by boat, but it is worth the ride. A boardwalk takes visitors across mangrove forests and hammocks of live oaks, cabbage palms, paradise trees, and wild limes to a neatly preserved Atlantic beach. During the summer months, the island is an important nesting area for loggerhead, leatherback, and green turtles. They come ashore at night to dig holes in the beach sand where they lay their eggs. The preserve is a favorite for nature students interested in learning about the native flora and fauna of Florida barrier islands. Visitors come to swim, sunbathe, or picnic at the pavilion on the quiet beach. Others make the trip for the great surf fishing. 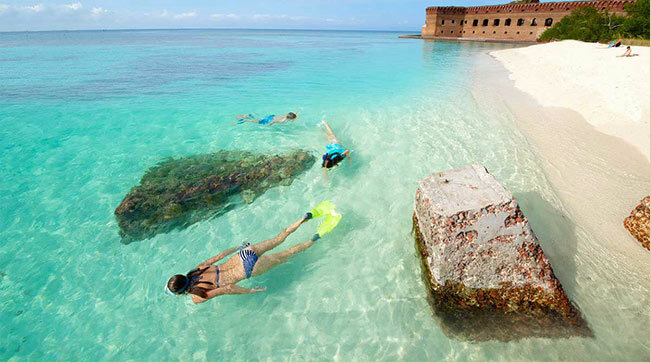 Snorkeling and scuba diving are also popular activities. Located at Port Salerno, on the Intracoastal Waterway, 2/3 of a mile south of the inlet.